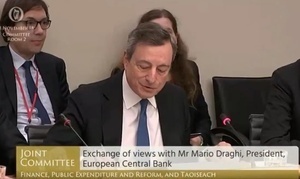 …Mario Draghi, head of the European Central Bank – addressing the Oireachtas Finance Committee – described the lending market here as being in a ‘monopoly or quasi-monopoly situation’. …The ECB chief also rejected suggestions that the bank presses member state lenders to dispose of non-performing loans in fire sales. He was responding to Sinn Fein’s Finance spokesman Pearse Doherty who asked if the ECB was pressuring banks to sell NPLs onto vulture funds. Mr Draghi said the ECB didn’t have a preference as to how the banks reduce their problem loan levels. 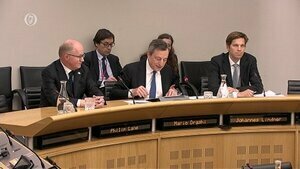 He said they have to examine the details of all proposals, including, as Mr Doherty suggested, a NAMA-type arrangement for the purchase of NPLs from the banks. Mr Draghi said he did not want to engage in a reconstruction of the past. Posted in Misc and tagged ECB, Mario Draghi at 10:40 am on November 9, 2018 by Bodger. Let’s hope Draghi will be able to cope with Doherty’s penetrating intellect. Doherty actually has a good intuitive grasp of economics and asks intelligent questions. He is admirable in that he generally goes into a committee room to learn something. Yeah, I’d agree with that. He’s not bad and seems to try figure stuff out. I can’t say the same about McGuinness. not sure of Doherty’s line of thinking here? Could it be that if we didn’t have to pay back these unsecured creditors, the excessive taxes of the last decade wouldn’t have been required, giving more consumers enough disposable income to be able to service their mortgages? Don’t really see how that’s the case. People don’t stop paying their mortgage when take home pay reduces by 5-10% (ie the tax increase we have seen). They stop paying when take home pay falls by 50-100%. I’d have hoped that one of our reps would ask ‘WHY NOT?’ to that statement. Strong chance that they just sit there and nod. The reconstruction of our past would highlight the destruction of our futures (put an echo on the word futures when reading). Happy Friday! Can someone explain this to me? Is the logic that if the bondholders were burnt, the banks wouldn’t have to chase the loans anymore? Surely it can’t be that? Only someone with Dohertys magisterial command of Shinner economics can understand what exactly he thinks he means. Its exactly that. And its nonsense. Regulation is to a large extent a fixed cost. Ireland is a small market, so the cost has to be spread over a lower number of customers. Ireland also has very borrower-friendly legal system. It’s not a huge mystery why European banks aren’t rushing in to enter the market.